Tucson, Arizona. Land of saguaro cactus, red desert and the yearly gathering of the Gastellum clan for Christmas. For as far back as I can remember, we would make the annual fourteen hour drive from Colorado to Arizona to spend one or two weeks with family in a continuous celebration that centered on the Faith, family and food. But before we made the trip our family made its own Christmas cards. My Dad's an artist and my Mom does beautiful calligraphy so we always had perfect cards to send out. Even farther back before Christmas my Mom would get each of us a Christmas ornament that had something to do with an event during the past year. One year I got a brass skier because I went skiing for the first time. Another year I got an ornament of Pikes Peak because I completed the half marathon ascent that summer. Ouch! My Mom's parents had lived in the same house ever since I could remember Christmas and later my aunt and uncle moved into the house three doors down. Several other aunts, uncles and various greats also lived in Tucson. I was even blessed with knowing my Great Grandmother. You know, the lady who was quick enough to catch mice by the tail? There was always an Advent wreath on the dining room table and Christmas stockings always made the trip with us. For some reason, the felt Advent calendar that my mom made with the snap-on ornaments for each day almost never made the trip so we only got about two weeks completed and then had to add everything else after Christmas. My mom collects Nativity sets and I think she got that from her mom. There were always a variety of Nativity sets around the house, missing baby Jesus, of course until Christmas day. Unfortunately, most sets are now made in China so our store isn't able to offer a large selection of them. On Christmas Eve we always had a traditional Mexican dinner with homemade tamales, re-fried beans, calabasitas and the best tortillas anywhere. We would then all gather in the spare room and with a roaring fire in the fireplace and the blinds strategically cracked open, my grandfather would read The Night Before Christmas from a huge coloring book that all of us cousins had taken a hand at coloring. Just like clockwork every year Santa would be on the roof, shout down the chimney and flash by the window before vanishing across the golf course behind their house. We would then all go back in to the living room and find our stockings full. My poor Uncle Steve, and some years Uncle John, frequently missed this momentous event. It's amazing how things always came up right at that time. 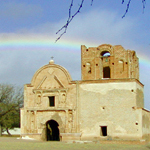 Some years we would go down to the Tumacacori Mission to sing carols and see the luminarias lining the church and walls at night. My family has a long association with the Mission. My grandparents celebrated their 50th wedding anniversary there and they met at the Catholic church just up the road in Tubac. One of my great-(great? )-aunts was scalped by Indians while her siblings hid in the mission bell tower. She survived. When we were all younger and had the energy we would then go to Midnight Mass and then come home and open presents. I don't know how my grandparents did it. Christmas day was the time to go visit Uncle Mannie and Aunt Armida. It was also the first place that I got bragging rights for eating exotic food. Every Christmas Aunt Armida made Menudo and I loved it. Christmas dinner was a traditional turkey affair. During our time in Tucson we had three typical site seeing visits to make. The first, and most regular, was a trip to the Sonoran Desert Museum. My Grandfather had been a park ranger most of his life and was a supporter of the museum. My favorite exhibits were always the prairie dog town and the geological exhibit with the earthquake detectors and the path through the “cave”. The second visit was a guy trip to some dive for authentic Mexican food. I don't remember the names of any of the places we went but you probably won't find them in tourist books. Some years we would make a trip to the Pima Air Museum or have a picnic at the Saguoro National Park. Yes, a picnic in December. Except for the one year it snowed and we had a snowball fight instead. Okay, now it's your turn. What fond memories do you have of Christmas? A side note about the Tumacacori Mission. Your grandparents were married there in 1939. The Mission had long been abandoned as a church, and the bishop had to give permission for them to have their wedding there. I thought that might be the case because of the wedding picture we have but since the Mission wasn’t still a church I thought I remembered wrong. It is so heartening to read of such a strong family with such good family traditions. We especially loved the story of the giant coloring book! We hope that that treasure has stayed with your family. It would be fun to show it to the next generation. Usually through our marriage we’ve had exactly enough children to be some factor of 24 (1,2,3,4,6,8), so we start our Advent calendar on Dec 1 and take turns who gets to open the doors, etc. We begin our Advent Wreath and Creche on the First Sunday of Advent (which is not Dec 1 very often!). We keep an extra set of Advent Candles each year so as to be able to set up in time for the First Sunday in Advent the next year. One of our favorite Advent and Christmas traditions is to set up our Nativity scene by the First Sunday of Advent so that we can watch the shepherds moving through the village, Joseph and Mary’s very long walk, Baby Jesus’ arrival; and eventually the Three Wise Men’s arrivals and departures! Daddy helps us dress it up with farm animals from his old trainset and we use mini-Christmas ornament type trees and such that we add every year. One day my near handicapped-with-pain mother met the sister in charge of moving the figurines as sister was entering the church and Mom was leaving. Mom said, “That little dog sure gets around!” and they both just enjoyed the biggest laugh! My husband moves the animals and birds at night and the children delight to see what “happened” during the night. We sure enjoyed your story. ‘Hope that this one is fun to hear, too. Have a holy Advent season!